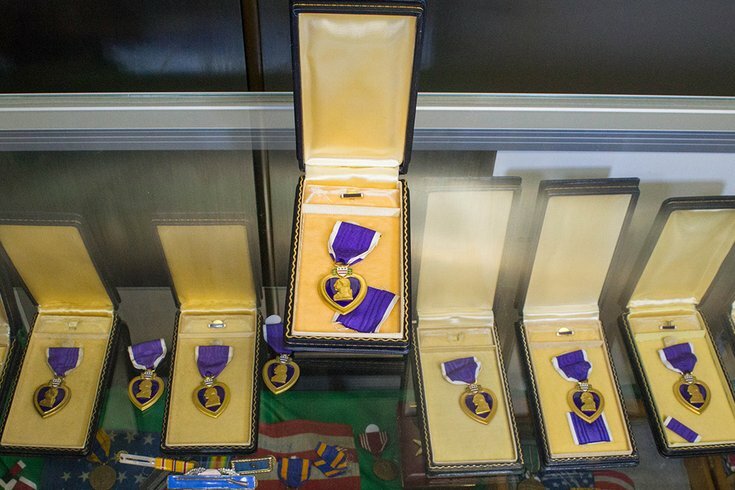 These are some of the Purple Heart medals in the possession of the Pennsylvania Treasury. It is trying to return hundreds of military medals to their proper owners. The Pennsylvania Treasury is attempting to reunited more than 500 military medals in its possession with their rightful owners. The medals, which include Purple Hearts, Bronze Stars and other types of service awards, are unclaimed property. Some have been in state custody for many years. In recent months, seven "lost" medals, including three Purple Hearts, have been returned to military veterans or their families, according to the department. State Treasurer Joe Torsella promoted his agency's efforts on Friday. Policy dictates that the Treasury policy can never liquidate the items, so efforts continue to get them returned to their proper owners. The lengthy process to regain ownership of a military medal can be arduous in an effort to preserve and protect the medals. It involves an exhaustive genealogy search to help find owners or heirs and prove entitlement. Treasury investigators use several search techniques to include partnerships with veteran groups along with commercially available search databases. Claimants may search Treasury’s website for unclaimed property, or Treasury’s Bureau of Unclaimed Property is also available toll-free at 1-800-222-2046, to help conduct a thorough search for unclaimed property.